Okay! All I am going to do is scroll down to the bar and click Save. Let's see if our URL pattern changes made an impact. So notice that when we clicked Save we jumped back to this Content listing page. If we wanted to view this page we need to actually click on the link. Okay! Our page got refreshed and we see at the top that our URL has not changed. We are at /content/ and then the title of our tour. We can ignore everything past this # right here from now. Let's go ahead and take a look at two different ways we can reset this URL. One of which is more useful for a single item, and one of which is more useful for both changing. Okay! I am going to go ahead and click the edit tab and this piece of content and then scroll down and click the URL path settings option. Go ahead and click the Automatic alias item here and instead it got unchecked after we first time edited our content, and click Save. Now if you will look at the URL, you will see that there are tours and then the title. So pretty simple all we need to do is check the same box that we didn't when we created the piece of content, in order to reapply any changes that we have made to the pattern. Much of the time though we will have created multiple items in a particular content type when we decided to change the pattern. So let's take a look at how we can change the patterns of both. Let's go ahead and go to the pathauto configuration of different paths and click on Modules, and then go into browser search for Pathauto. Next to Pathauto here we have a Configure link right here. Go ahead and click that. Okay! So we are back in our patterns. We notice at the top that we have a number of tabs we can click for URL aliases. We have PATTERNS we also have BULK UPDATE for aliases. 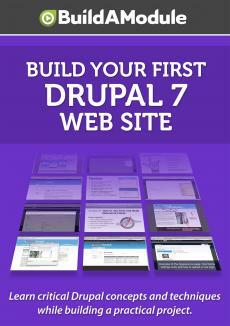 In this collection, we take you through the process of building a fully functional Drupal 7 web site, step by step. No prior Drupal experience is required, and when you're done you will have learned the most important components of Drupal site building and will have developed the skills to tackle unanticipated problems as they arise. There are no particular prerequisites for this collection. 2:17How to fix "This field has been disabled because you do not have sufficient permissions to edit it"